With spring fully upon us now the yards and green spaces around us are changing so quickly. Each day as we walk our neighborhood there are more flowers to see, more birds that are active and so much more color and green around us. If you blink you will miss the best part of the year!! So, I thought I would share some of the activities that we do while we are on walks around our neighborhood or on hikes. Planning a simple activity to do while you go for a walk or hike can add so much more enjoyment and learning to the experience, plus it means that you will never get bored of the same few blocks around your home or the same trail at the local park. Bug Safari - the bugs are just starting to come back out. So why not bring along a simple net and clear container to see what you can catch (and of course release!)! A listening Walk - no equipment needed, just your ears! Color Counting - use a simple chart and stickers to get your kids actively counting the colors that they find. Phonics Scavenger Hunt - add words to your pictures for some letter recognition. Ice Hunting - if you are still in winter or have chilly mornings you might still have a bit of ice on your streams and ponds. Let your kids explore the ice with sticks and rocks. What can they break? Where do they see the most ice? Fall Leaf Walk - if you are in Fall and not spring these books might be a great addition to your leaf hunting! What do you do on a walk with your preschooler or toddler? If you have a walk activity please share it with me so I can get even more great ideas! The girls and I decided that with spring coming so fast in WI the birds would need to be making new nests to hold their eggs and might need some help. And we want to make sure that they have plenty of places for good homes. So we are helping them out by making a few bird houses for them! We started out with an orange juice jug and a quaker oats container. After they were thoroughly covered in paint and dried we decorated them with stickers! I put modge-podge over the stickers and paint to "seal" it from the weather. Not sure this is the best kind of seal for this project but it works pretty well. Once they were all dried we pushed a wood cooking squirer through the bird houses and then filled the bottom of the houses with grasses and other soft natural materials for the birds to use. Then Sam picked out where she wanted to hang her house! Avery was not ready to hang her's up yet so it still sits on my kitchen counter. I will wait a few more days to let her decide where she wants to hang it. But now we wait to see if the birds will find the house and use it to lay some eggs. How are you getting ready for spring? Are you helping the animals in your yard get ready for spring? We started by talking about where bears go when it gets cold and what they might use to make their hibernation spot more comfortable. The girls thought their princess tent filled with pillows and blankets would make the perfect bear cave. But the tent was not as dark as they thought a cave would be. So more blankets were needed! Then they settled in to hibernate like bears do! Sam quickly decided that bears must get very bored while they hibernate and she decided it would be better if they had books! Hibernating quickly turned into very comfortable reading time! HA! But this pretend play got us to have great conversations about why some animals hibernate and others don't. And what it must be like to hibernate. Love when pretend play can directly lead to learning some great lessons about the animals around us. We set this all up in the morning and the timing worked out perfect that when they were tired of pretending to be bears it was lunch time. This gave me the perfect opportunity to talk about how hungry animals must be when they finally wake up for spring. The girls had fun pretending it was finally spring and they could eat again! I think it also led them to eat a bigger lunch!! We learned about squirrels in winter here. Chris, the girls and I took Uncle Craig to Devil's Lake State park today for a little hiking. We ran into a few obstacles that we had not thought about (like very icy spots on the trail and strong winds when we were hiking down by the water) but overall it was a great morning. The little bit of snow added the fun of looking for tracks, making our own tracks and more. A little snow snack at the top! And me and Avery being silly on the trail! And some fun ice/water play when we got to the lake at the bottom. We were trying to land rocks on top of the ice without breaking the big chunks. It was a fun little challenge! And of course when we got to the boulder fields we had to take some cute photos. It was a great way to spend our morning and everyone came home completely exhausted! If you are thinking about doing some winter hiking with your little ones, and I would strongly encourage it, there are some things to keep in mind. First, will the trail be safe. We did have a bit more ice on the trail than I had expected. Sam did fine with it, but we had to adjust our hiking style. Sam was not allowed to run ahead or be as wild and silly on the trail. We had to hold her hand and have her hike next to us more than we normally would. If you are unsure what the trail conditions are I would suggest calling ahead (if there is an information center or nature center available) and asking about ice or snow on the trail. Second, dress your little ones in more layers than you think they need. Just like any winter outdoor play your kiddos will have a much better time and last longer if they don't notice the cold at all. But keep in mind their ability to navigate the trail as well. Even though snow pants might be the best way to keep them warm, those big puffy pants will make it very tough to walk up hills, over rocks or other rough terrain. Try using tights or leggings combined with fleece/flannel lined pants as a way to give them the warmth they need but also a bit more flexibility. Third, bring extras! We started Sam out in her tennis shoes today but I had her snow boots packed in our backpack so that when her shoes got wet from the snow we would have a back-up to keep her comfortable and not end the hike. Extra clothes are important too. You never know when falls in the snow may happen and with no snowpants on clothes may get wet, having extras to change into may save the day! Any other winter hiking tips or tricks? 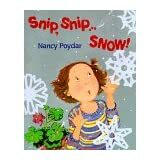 Just wanted to share a few books we are reading right now to get us ready for colder temps and lots of snow. Because eventually the 40s and 50s that we are having will go away and the snow will start to fall! What are you reading right now? 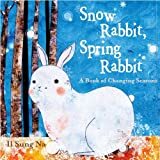 Do you read books that go with the seasons? Loving the outdoor play link up right now! Have you checked it out? I am getting tons of new ideas for things to do outside and connecting with a lot of new bloggers. So welcome to any new readers that might be stopping by! Leave me a comment and let me know that you are here!